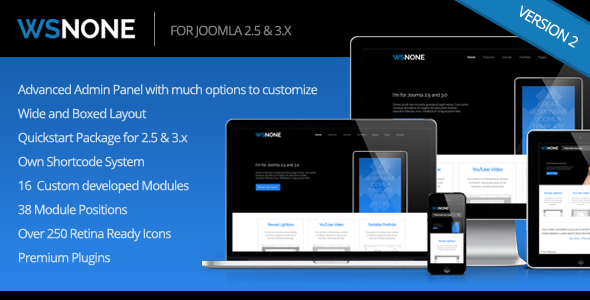 WS-None is a smart and clean Premium Responsive Joomla Template for 2.5 and 3.x based on the powerful Foundation 3 Framework. A lot of build-in-extensions and functions will give you a new experience in Content Styling. With the 100+ features, WS-None is providing you with the professional look your website might be looking for.WS-None is a smart and clean Premium Responsive Joomla Template for 2.5 and 3.x based on the powerful Foundation 3 Framework. A lot of build-in-extensions and functions will give you a new experience in Content Styling. With the 100+ features, WS-None is providing you with the professional look your website might be looking for.